The prophet Amos ministered in Israel during the reign of King Jereboam [Amos 1:1], and his main message was largely similar to that of the prophets before him – seek the Lord, return to the Lord or face destruction. He was a shepherd, untrained as a prophet, and his time of ministry was brief as compared to some of the other prophets, but as a minor prophet the book of Amos is notably longer than most others (ending with 9 chapters). He came between two of the most dramatic minor prophets, Jonah (who was once swallowed by a fish for 3 days) and Hosea (whom God told to marry a prostitute), and thus in comparison his life seemed bland, though his message was most certainly not. In Amos 8 in particular, Amos prophesied the eventual rotting and corruption of Israel, with imagery that is no less graphic than his predecessors and words no less tragic than those before him. The build up to the focus of today is immense – In verses 1-3, Amos began by saying that the time is ripe. In verses 4-6, Amos proceeds to talk briefly about the sins of the Israelites. In verses 7-10, Amos talks about the certainty of God’s judgement and the severity and extent of it. 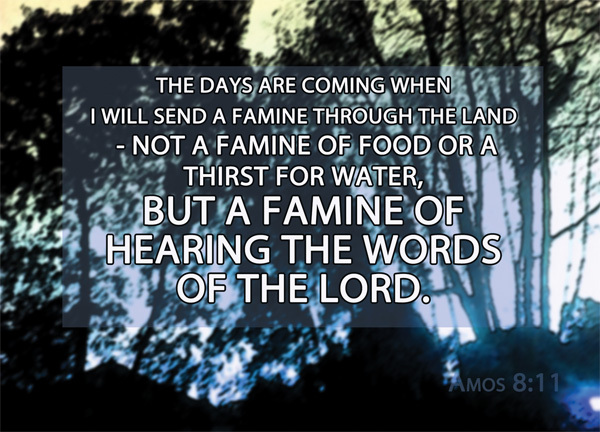 In verses 11-14, Amos talks about the famine of hearing the word of God and very kindly gave an image of the consequences of it. Today, we will focus on the famine of hearing the word of God, and we will apply it to our lives using a favourite device of the prophets – imagery. “The days are coming,” declares the Sovereign LORD – this is very much an emphasis of verses 1-3, where Amos saw a vision of a basket of ripe fruit that symbolised the time is ripe. This is a certainty, as of all prophesies in the Bible. It’s always coming. We don’t know when, but it’s coming. The types of famine – when I will send a famine through the land–not a famine of food or a thirst for water, but a famine of hearing the words of the LORD. 1. a famine of food – what are the characteristics of a famine? In general, it is understood as a scarcity of food, traditionally caused by poor local crop yield due to a variety of reasons like bad weather, locusts outbreak and so on. It is a disaster, a period of suffering, and a period of time that every nation and government and people would never desire or want to have. It might not cause death directly – but will lead to a variety of circumstances that may cause death – starvation; diseases brought on by malnutrition, injuries caused by robbers of food, murders caused by desperation and so on. There might be rations – yet it is unlikely to be sufficient to satiate the people. 2. a thirst of water – in other words, a drought, where there is a long term insufficiency of potable water. Traditionally caused by a lack of rain; can also be caused by water pollution and other human factors. Water is more essential to the survival of a human being than food is, in general. It is a disaster, a period of suffering, and a period of time that every nation and government and people would never desire or want to have. People will kill just for a sip of water. Some will drink their own urine. Others will drink whatever they can find – even stale water, unclean water, even dishwashing liquid. And people will die by the hundreds, by the thousands, by hundreds of thousands. A surge of corpses will bring forth even more diseases. 3. a famine of hearing the words of the Lord – Have you ever heard of the ‘if you wake up tomorrow and all the Bibles in the world have disappeared’ scenario? Well, let’s play this scenario in our heads. If you wake up tomorrow and all the Bibles in the world, in all languages, in all forms, whether hard copies, handwritten notes and manuscripts, mobile or digital versions have all disappeared, what would you do? Believers of the Bible will gather, desperately to try and piece a Bible together from the verses that they have memorised. Many of the verses would be highly inaccurate due to intentional foul play, or an imperfect memory. Versions will clash against versions, interpretations against translations. And that’s not all. Imagine if all the forms of sermons and preachers have disappeared as well. Well, perhaps via government law. A famine of hearing the words of the Lord. It’s not that the word of God has disappeared, but simply our means to hear the word will disappear. Maybe not entirely, but it will be insufficient. No word of God as our daily bread, no presence of God as our living water. Some may not feel the pain – especially if they did not believe in the word in the first place, in fact, it may not seem apparent to Christians that we’re missing the word of God in our lives – but affliction and pain will awaken our need for hearing the word of God. In times of suffering, our thirst for the living water and our hunger for the daily bread will be multiplied. According to the Bible, it is probable that some tribes/regions/peoples are already suffering from the famine of hearing the word. Some say the Jews are in a famine of hearing God’s word, though I don’t quite agree. Regardless, it points to the idea that a people or a nation can bring upon its own famine of hearing the word of the Lord by its continual refusal to follow the word of the Lord – Who has believed our message [Isaiah 53:1, Rom 10:16]. If God gives the word to you, and you do not read; if God sends preachers, but you do not listen – surely God has every right to take it away – though not used in this context, this sentiment was very clear to Job in [Job 1:21]. Let us not take the word of God for granted, let us not take anything from God for granted – let us be wary of this spiritual famine, which can certainly be far more devastating than a world-wide famine. Like a usual famine, it is devastating, but its effects are perhaps most felt with the indirect consequences of the famine. A moral breakdown. An emotional breakdown. A social breakdown. And more. I don’t know about you, but it’s an entirely frightening prospect to me. A famine of hearing the words of the Lord. You won’t die, unlike famines and droughts, not physically at least – but you will likely starve and thirst spiritually till your spiritual death. Don’t ask me what spiritual death is like, or if it’s theologically possible – I’m frightened even by the very idea of it. A famine of the word of God is perhaps one of the heaviest judgement on humanity. Treasure the word of God – we often, too often take it for granted. Let us cherish the privilege of hearing God’s word – a privilege that we still possess today, and follow the precepts of God. If anything, let us not fear famines or droughts, for we can still lean on God and hope in him. If anything, let us instead fear the famine of hearing God’s words. Let us fear sinning this privilege away. Amen Zecqi… I fear a worldwide famine of the Word of God. It could be devastating. Very wise teaching, my friend. I would like to begin working on the “Share the Love” project for April, and I am still hoping that you will agree to allow me to feature your blog. Please respond and let me know if you are agreeable. I truly believe that people need to be exposed to wise, biblical teaching, and your blog does just this.